The Coil On Plug (COP) Quick Ignition tester is a battery-operated, hand-held quick tester designed to easily and quickly determine if a COP is producing a proper spark for the plug. Consistent, steady flashing and beeping indicates the COP is producing the correct amount of voltage. The kV/Arc Quick Tester is a battery-operated, hand-held tester designed to easily and quickly check the presence of a spark in the vehicle's cylinders, determine the polarity (+/-), and measure the peak voltage as the spark plug is firing on Distributor and Oistributodess ignition Systems. -If the tester does not detect a spark after 30 seconds, it automatically turns off. -The Quick Check Mode may not detect spark voltage less than 5 kV. Use the Measurement Mode to verify. This product consists of two of our AMT products: AMT760 (Ignition System KV Quick Tester) and AMT750 (Coil on Plug Ignition Quick Tester). The two products are used to test car ignition system. AMT750 is used to test COP (Coil on Plug) ignition system. Technicians can use this product to test KV value and Arc (glow) duration output. The kV/Arc Quick Tester AMT760 is a battery-operated, hand-held tester designed to easily and quickly check the presence of a spark in the vehicle's cylinders, determine the polarity (+/-), and measure the peak voltage as the spark plug is firing on Distributor and Oistributodess ignition Systems. 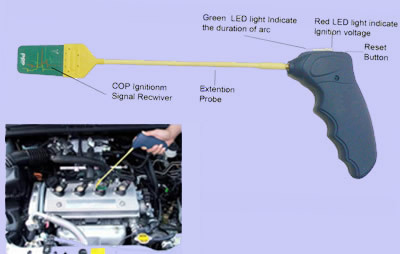 The tester works by receiving a signal transmitted from the spark plug's wire. In the Quick Check Mode, the red LED light flashes when a spark is detected, If the polarity is negative (-), the green LED lights; and if positive (+), the red LED lights. In the Measurement Mode, the tester measures and displays the peak spark voltage for approximately 15 seconds. The Coil On Plug (COP) Quick Ignition tester AMT750 is a battery-operated, hand-held quick tester designed to easily and quickly determine if a COP is producing a proper spark for the plug.